The park, located on the Virginia/ Kentucky border, is one of only two Interstate Parks in the nation and encompasses 4,500 acres of greenwood lands and mountain scenery. 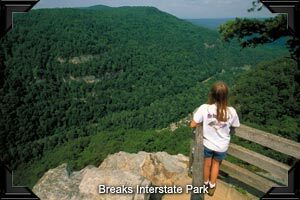 The name "Breaks" is derived from the break in Pine Mountain created by the Russell Fork of the Big Sandy River as it carved a 1,000 foot gorge on its way to the Ohio River. The Russell Fork River has carved the largest canyon east of the Mississippi. Daniel Boone is credited with discovering The Breaks in 1767 as he attempted to find ever-improved trails into Kentucky and the Ohio River Valley beyond. Passes through these rugged mountains were called "breaks" by early settlers.